Attendees at the annual Consumer Electronics Show (CES) in Las Vegas can typically expect to see a variety of innovative gadgets, from high-resolution TVs to concept cars and virtual-reality headsets. This year, however, the CES floor featured one exhibit that might seem a little out of place: a beehive. Created by a French company called Beelife, the CoCoon beehive is specifically designed to protect bees against varroa mite infestations. 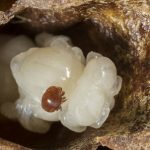 Varroa mites, which infect bees with a deadly virus that can effectively wipe out entire colonies, constitute one of the foremost threats to modern honey bee populations. Although the parasitic mites can be next to impossible to eliminate once they’ve invaded a hive, they are vulnerable to high temperatures. After being exposed to temperatures above 108°F for a few hours, the mites will begin to die. Bees, on the other hand, can survive in high temperatures with relative ease. The CoCoon beehive exploits this weakness by using a solar-powered heating system to gradually warm the hive’s interior until it reaches 108°F, creating an environment that is deadly to varroa mites. This same system can also cool the hive on especially hot days to keep bees comfortable as well. The CoCoon even features a sensor array that allows beekeepers to monitor hive activity from a tablet or smartphone. Unsurprisingly, the CoCoon is expected to be far more expensive than your average bee hive, but its ability to protect bee colonies against varroa mite infestations could make it a worthwhile investment for some beekeepers. According to Beelife, their high-tech heated hive is slated to go on the market in late 2019.